Bitcoin jumps more than $1,000 in about 12 hours as gains accelerate. The digital currency jump follows increased investor interest in bitcoin around the Thanksgiving holiday and the U.S. launch of the world's largest bitcoin exchange by trading volume, Tokyo-based bitFlyer. Digital currency ethereum also hit a record high Wednesday of $519.85, according to CoinMarketCap. Bitcoin swung hundreds of dollars Wednesday morning. The digital currency spiked through $11,000 early Wednesday, hours after surpassing the $10,000 level for the first time. By 9:16 a.m. ET, bitcoin had leaped all the way to $11,377.33, according to CoinDesk. But just over an hour later, bitcoin was back below $11,000 trading near $10,777.27 as the new milestones brought with them rapid volatility. "Parabolic rallies are inherently unsustainable, otherwise bitcoin's value would surpass all the wealth of the world within a few years," Ari Paul, CIO and managing partner at cryptocurrency investment firm BlockTower Capital, said in an email to CNBC. "But ... while the pace of the rally is unsustainable and there will inevitably be corrections and crashes over time, it remains 'cheap.'" Since bitcoin's market capitalization is less than $200 billion, enthusiasts point out the digital currency could rise dramatically if it draws even a tiny fraction of the world's $200 trillion in traditional financial market assets. Much of bitcoin's incredible initial gains came just about 12 hours after the cryptocurrency smashed through the $10,000 mark that many analysts had been hyping for months. But few saw it happening this quickly. All told, it's been an exponential ascent from 6 cents seven years ago and less than $1,000 at the start of this year. Bitcoin jumped above $9,000 over the weekend — just about a week after topping $8,000 — as about 300,000 users joined Coinbase, the leading U.S. platform for buying and selling bitcoin, around the Thanksgiving holiday, according to data compiled by Alistair Milne, co-founder and chief investment officer of Altana Digital Currency Fund. "We are experienc[ing] all-time high traffic at the moment," Coinbase's director of communications, David Farmer, said in an email Wednesday morning to CNBC. The "vast majority of traffic is being served but with slower performance. Our engineering team is actively working on this and should be fully resolved in a couple of hours." Separately, Coinbase's GDAX exchange said in a status alert email Wednesday at 9:46 a.m. that "GDAX is experiencing intermittent login issues. Our team is investigating." In addition, the world's largest bitcoin exchange, bitFlyer, announced Tuesday it is launching in the U.S.
U.S. dollar-bitcoin trading volume only made up about 21 percent of the total Wednesday, according to CryptoCompare. Japanese yen trading in bitcoin dominates at about 64 percent, while trading in South Korean won accounts for about 8 percent, according to CryptoCompare. 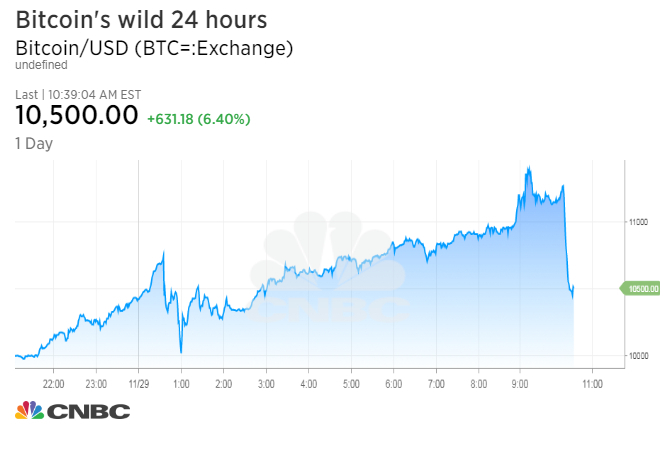 "It's really a global phenomenon, not just a U.S. phenomenon ... which probably pulls the [bitcoin] price higher over time," Nick Colas, co-founder of DataTrek Research, said Wednesday on CNBC's "Squawk on the Street." Colas pointed to Google search trends for "bitcoin" that show South Africa and the Netherlands consistently rank near the top. The U.S. typically ranks 11th or 12th, Colas said. Digital currency ethereum also hit a record high Wednesday of $519.85, according to CoinMarketCap. The bitcoin offshoot, bitcoin cash, traded slightly higher near $1,619.36, well off its record high, according to CoinMarketCap. In another move toward establishing bitcoin's legitimacy as an asset class, the world's largest futures exchange, CME, is planning to launch bitcoin futures in the second week of December. More than 120 "cryptofunds" have launched, including some run by Wall Street veterans, according to financial research firm Autonomous Next. Former Fortress hedge fund manager Michael Novogratz predicted on CNBC's "Fast Money" in October that bitcoin would reach $10,000 in the next six to 10 months. As bitcoin rose above $9,700 Monday, Novogratz said in another "Fast Money" segment that bitcoin could "easily" be at $40,000 at the end of 2018. But he told attendees of CoinDesk's Consensus Invest conference in New York Tuesday that crypto "is going to be the biggest bubble of our lifetimes by a longshot." However, other market watchers remain highly critical of bitcoin. JPMorgan Chase CEO Jamie Dimon has called the digital currency a "fraud" and BlackRock CEO Larry Fink has said bitcoin is an "index of money laundering." Aswath Damodaran, a professor of corporate finance and valuation at New York University's Stern School of Business, has also noted that unless bitcoin can be used for ordinary transactions, "it could be just another fad."